The Voynich Manuscript – At least 600 years old, this is a 232-page illuminated manuscript entirely written in a secret script. It is filled with copious drawings of unidentified plants, herbal recipes of some sort, astrological diagrams, and many small human figures in strange plumbing-like contraptions. Carbon-dated to the early 1400s, it was brought to modern attention in 1912 when it was purchased by Wilfrid Voynich from the collections at the Villa Mondragone, near Rome. Color images of all of the pages can be seen at archive.org and Yale’s Beinecke Library website (the current owner of the manuscript). … Attempts at identifying the plants can be seen here, and more information about the Manuscript can be found at voynich.net, voynich.nu, and crystalinks.com. Rongorongo Script of Easter Island – In 1868, Europeans first reported seeing wooden tablets on the incredibly remote Easter Island in the south Pacific. The tablets were covered with an unknown hieroglyphic script. Only 20 or so tablets are thought to be in existence, with little progress in determining what it is that they say. Zodiac Killer ciphers – From 1966 to 1974, the Zodiac serial killer sent more than 20 written communications to police officials. Most of these messages have been cracked, but there are still some that remain unsolved. The killer was never caught. 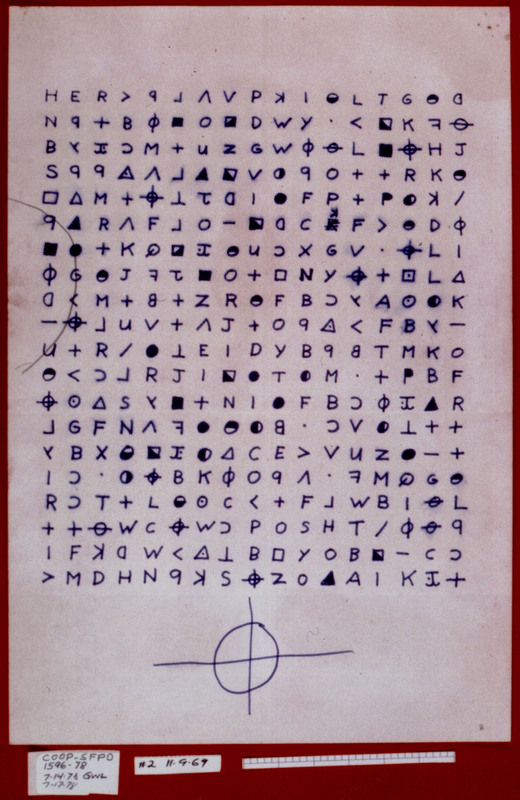 The first reader to correctly crack this Zodiac Killer cipher shall receive a prize of $20.00 in cold hard cash. Someone named Dave has posted a neat interactive way to try to solve it. Photos from the Grammy Awards!